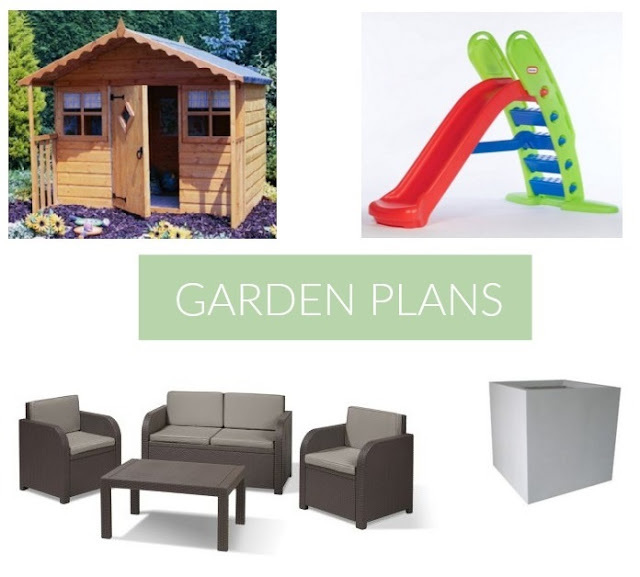 Now that Winter is almost over and Spring is finally in sight, I've been thinking about plans for the garden and what we can do to make it the perfect space for us to use, once the weather (hopefully) improves! We moved into our new home last August, so we've had plenty of time to get the house how we want it. However, we haven't really done much to the garden as we didn't really have the time when we moved in and then Winter arrived, so there wasn't much point then. I have to say, one of the things that drew us to this house was the size of the garden. It's a really good size, especially compared to the garden at our previous house (which was tiny!). Here's what's on my garden wishlist.. Wooden playhouse - I've wanted to buy Sophie a wooden playhouse for a while, but decided to wait until Summer. I'm pretty stuck for ideas what to get her for her birthday in June, so I was thinking of doing this playhouse up for her instead. I think she will love it! Little Tikes giant slide - We already have the Little Tikes First Slide, but Sophie has definitely outgrown it now. I thought this one would last a bit longer, as the age range is 2-6 years. I would recommend checking for vouchers, before purchasing items online, as you may find an offer or code which could save you money. Allibert St Tropez Rattan Furniture Set - I'd love some nice garden furniture, especially now we have a bigger garden. Square planter - We already have a couple of these planters, but I'd love a couple more. Flowers just brighten the place up and you can never have too many! For some reason, we've now got two sheds in the garden as well as a storage box from the previous house, but they're taking up too much room. The plan is to de-clutter one of the sheds and then get rid of it so we just have the one (as well as the storage box, for Sophie's toys). That will make more room for Sophie to play, as well as for us if we hold any garden parties in the Summer. I've also been browsing Pinterest and came across a DIY bar made from left over palettes. I showed Toby and he loved the idea, so hopefully he will build us one. It would be perfect for Summer barbecues! What are your garden plans for this year? Great post, I want to add flowers and a play house, along with a few other toys for the kids!